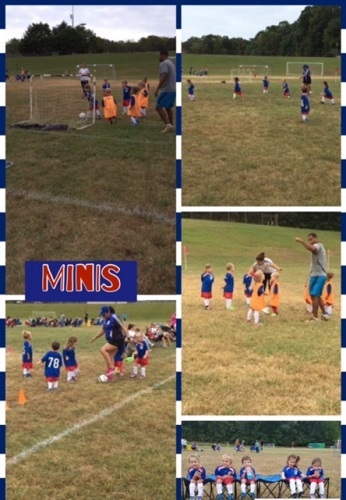 The Mini-Strikers Program is for younger children ages 3 to 4 years to have fun and take the very first steps in learning soccer. Children and parents will be involved in learning through games and activities that get kids running and active, and participating with others in an age appropriate manner. Kids practice twice per week and play one small sided game each week to maximize their “touches” on the ball, provide the optimum number of teammates for their age, and keep them engaged and eager to play. This is not just a clinic involving a few practices. Kids play games of soccer appropriate for their age and receive their own uniform to keep, just like their bigger siblings and neighbors. Parents learn about what to expect from their child and how the game works. Whether it is a simple fun thing to do, a healthy way to excercise and be social, or the start of a lifelong passion, we’re ready to play! This is an opportunity for kids and parents to have fun together! Space is limited and goes very quickly. Please register early. We try to take as many players as we can!